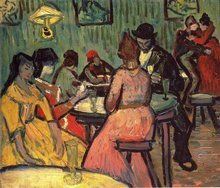 The Dance Hall in Arles depicts an evening at the dance hall of Folies-Arlésiennes in Arles. 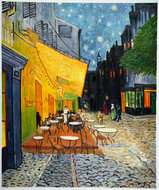 Unlike others, this painting is a combined work of Van Gogh and Paul Gauguin. 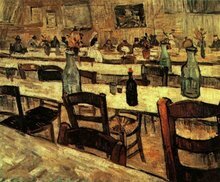 The Dance Hall in Arles is reproduced by talented and experienced artists from Holland and the rest of the world. 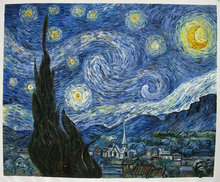 Our artists have studied Van Gogh’s paintings and techniques like ambience, color mixing, and brush strokes for years. 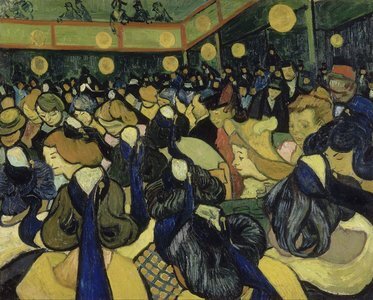 The Dance Hall in Arles was a joint venture by Van Gogh and Paul Gauguin, and it was painted in 1888. Despite their differences, the duo started working together on temporary grounds as they were trying to improve their relationship. Their differences were quite evident in Van Gogh’s “The Poet’s Garden” and Gauguin’s “Les Arlésiennes”. While the former was inspired by nature, the latter was inspired by memory, but both the paintings show the same park. The two artists yearned to create a “studio of the Midi”. However, Van Gogh’s dominating style and Gauguin’s independent nature clashed and it led to Gauguin walking off. The Dance Hall in Arles incorporates Gauguin’s idea of Cloisonnism and features flat and bold forms with dark separations. 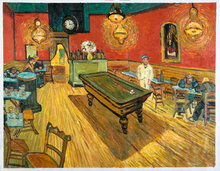 This aspect clearly depicts Gauguin’s influence on Van Gogh’s individual style. The dance evening in the painting exhibits unique elements inspired from Japanese artwork which is Gauguin’s individual style. One can see the unusually elevated line on the horizon in the painting as well as swirling curves in hair. The painting shows one person, Madame Roulin looking up and outward from it appearing to express claustrophobia and anguish.